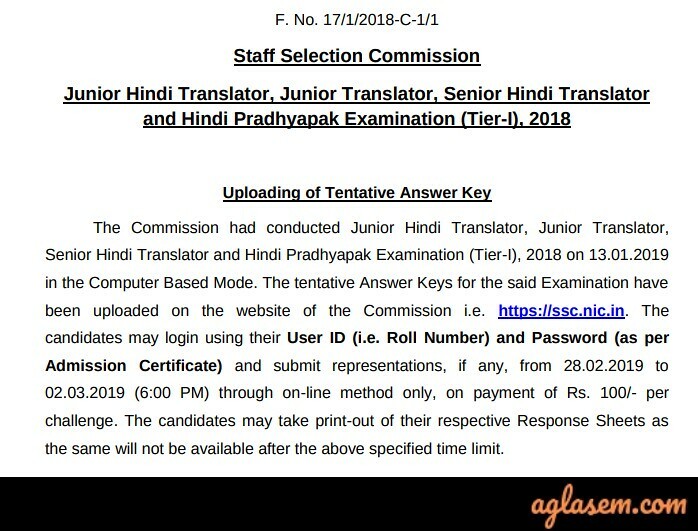 SSC JHT 2019 Answer Key – The Staff Selection Commission (SSC) has released the SSC JHT provisional Answer Key 2018 at ssc.nic.in on February 28, 2019. The SSC JHT Answer key released for the examination held on January 13, 2019. The candidates who have appeared in the examination can check the answer key through the login. the candidates have to provide the user id and password to check the same. SSC is also inviting the objection on the JHT Answer key 2018 from February 28, 2019, to March 02, 2019. After considering the objection the final answer key will be released. Get here full details of SSC JHT Answer Key. Latest: The SSC JHT Answer Key 2018 has been released. Scroll down to access the link. As the answer key is available in the login, the candidates can download it and can calculate their marks. The with help of the markings scheme the candidates can get the exact idea of the marks they will get in the exam. Answer Key: Click here to check SSC JHT 2018 Answer Key. How to Download SSC JHT Answer Key 2018? The answer key has been released by SSC, and the candidates who have appeared in the examination can check their answer key. The candidates can check the steps to download the answer key. That redirects to the login page. On entering the details the answer key opens. The candidates can raise an objection if they want. How to Calculate Score Through SSC JHT 2018 Answer Key? Add the scores to get a rough estimate of your official SSC JHT 2018 Result. How to Raise Objection to SSC JHT Answer Key 2018? Candidates can raise an objection to the Provisional Answer Key of SSC JHT 2018. This can be done through the above link to check the answer key. The candidates have to pay objection fee, of Rs. 100/- through online method only. For the reference purpose, the candidates can take the print out of the representation submitted by themselves. However, this has to be done with the stipulated time allotted by the Commission in its official notification. Any objections later than the last date allotted for objection will not be accepted. From the date of closing of the representation (objection) window, the SSC will put all the objections they received to intense scrutiny. After the period of careful scrutiny, the Commission will release the Final Answer Key. Any objection to the Final Answer Key will not be entertained. After receiving the challenges and objections against the initially released provisional Answer Key, the SSC will be subjecting these objections to intense scrutiny to look for the validity of candidates’ claims. However, the decision of the SSC will be final in the end. If the SSC notices that the answer key requires modification, it will make all the necessary changes. The newly modified Answer Key is then released on the Official Website in the form of the Final Answer Key. The new and final Answer Key will be a consolidated document which will not be up for any debate or challenge afterward. Right after the release of the Final Answer Key, SSC will declare the result of the Paper I Computer Based Test on its official Website. Along with it, it will also release a merit list of candidates qualifying in the Paper I examination having scored the minimum cutoff marks or more. These are the candidates who will proceed on to receive the SSC JHT 2018 Admit Card for the Paper II Conventional/Descriptive Written Test. The final results will be declared at the end of the examination procedure after Paper II examination will be conducted and analyzed. The final results will be the basis upon which candidates will be recruited to the vacancies of Junior Engineer through this recruitment opportunity provided so handsomely by the Staff Selection Commission.